The pagoda grounds possess poetic scenery with green trees, glassy lakes, and an abundance of calligraphic works. There are five lakes in total each with elegant bridges. You will find many calligraphic works written on stones or columns too, there’s even a house for calligraphy in the pagoda. 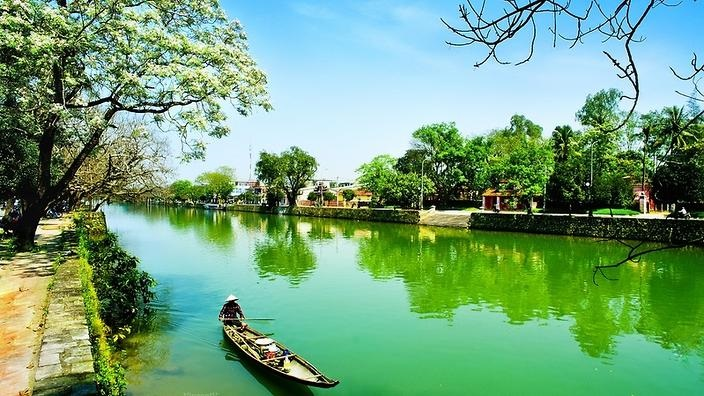 Hue has a subtle and peaceful beauty that does not exist anywhere else in Vietnam, that may be due to the tranquility of the pagodas located in and around the city. Visit the hundred-year-old pagodas in Hue to experience the peace in your soul and the spiritual beauty of the city. 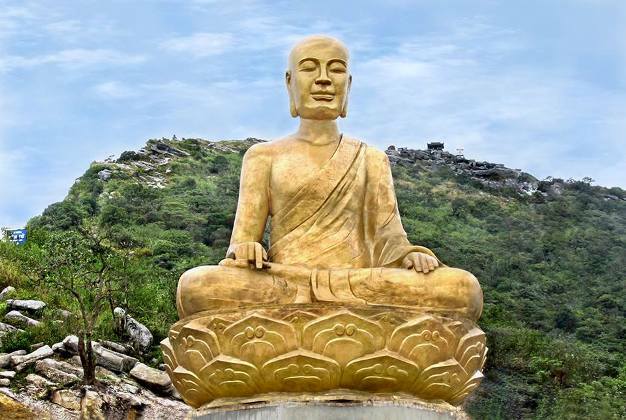 There is no exact information about when Buddhism entered Vietnam, but it’s estimated to have made an appearance in the period between the third century B.C. and the first century A.D. The golden time of Buddhism in Vietnam was from the 11th to the 15th century, when the country was under the rule of Ly and Tran Dynasty. At that time, many pagodas were built and the monks were considered the upper class in the society. Many emperors of these two dynasties even took refuge in the Three Jewels (i.e. became a monk) and ceded the throne to their sons. 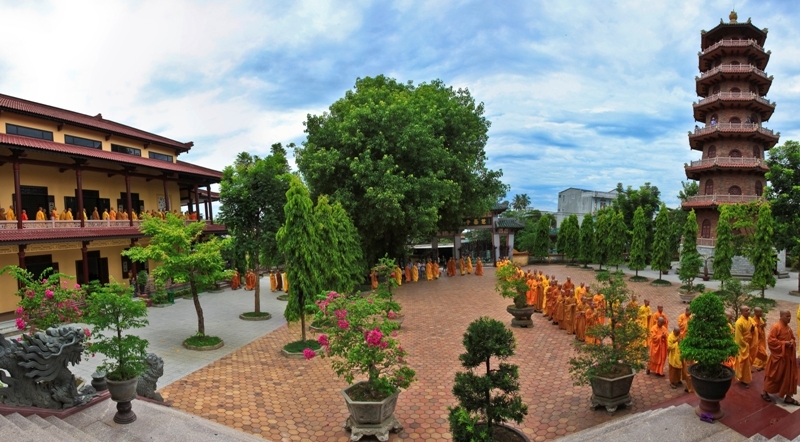 Hue was once known as the center of Buddhism in Vietnam. Since Hue became the capital of Dang Trong (Southern Vietnam when Vietnam was separated by two governments from 1600 to 1774), then the Tay Son Dynasty, and finally the Nguyen Dynasty, many pagodas were built and reconstructed, turning Hue into the capital of Vietnamese Buddhism. Hue has a high density of pagodas with more than three hundred pagodas, around a hundred of these are old and still remain as totems to the traditional architecture of East Asia and Vietnam. There are many statues of the Buddha and Bodhisattva, copper rings, and other old documents of Buddhism of Le, Trinh, and Nguyen Era worshiped and preserved in Hue’s pagodas. Thien Mu Pagoda is known as the first ancient pagoda of Hue. 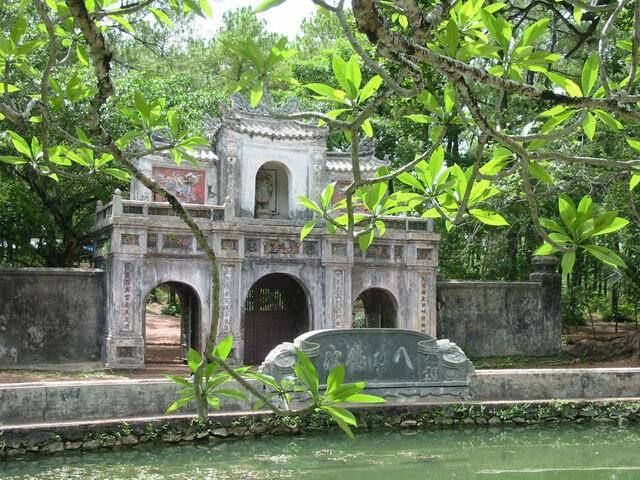 It was first built in 1601 at the order of Lord Nguyen Hoang. A legend exists that every night the locals saw an old woman in a red shirt and green trousers standing on the hill that this pagoda would eventually be built on. She said: “A Lord will come and build a pagoda to maintain the good layer of earth for his power.” When Lord Nguyen Hoang heard the story, he ordered a pagoda be built with the name Thien Mu (literally means “the woman of heaven”). Throughout history, it was destroyed and reconstructed many times, but still remains as a great testament to our ancient architecture. In 1710, the Bell was built with the height of 2.5 meters and the weight of two tons. Lord Nguyen also asked his subordinates to go to China and bring back more than a thousand books of Sutra. This pagoda was constructed following the Chinese character “one” (the horizontal stroke “一”) and faces the same direction as Phu Xuan Imperial City (also known as Hue Imperial City). 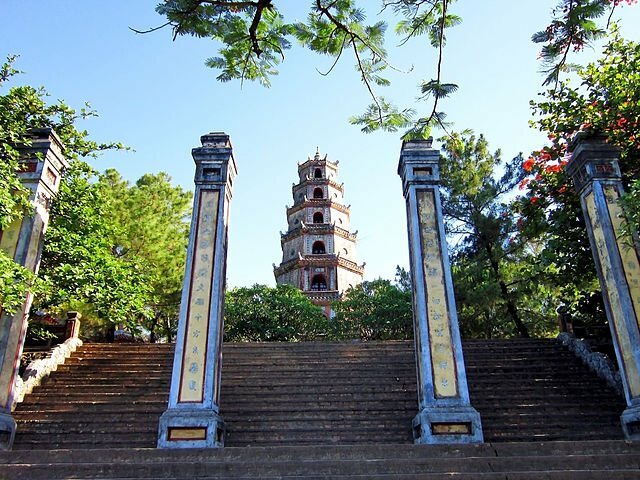 Thien Mu Pagoda has several important features: Phuoc Duyen Tower (built in 1884), Big Copper Bell (1710), Literature Stone and Turtle (1715), the autographs of the emperors Thieu Tri, Thanh Thai, Khai Dinh (of Nguyen Dynasty), and the Main Palace (1714). Tu Dam Pagoda is located on a hill near the tomb of Phan Boi Chau, a famous Vietnamese nationalist. It was built around 1695 to 1702 by a Zen master immigrating from China (the Thanh Dynasty was ruling in China at that time) and named An Ton. In 1841, Emperor Thieu Tri changed the name into Tu Dam because the original name was similar to the name of the emperor, which was Nguyen Phuc Mien Ton. During the restoration of Buddhism in the early 20th century, Tu Dam Pagoda played an important role. It has been the headquarter of Thua Thien Provincial Buddhist Sangha since 1938. Hundreds of praying houses and pagodas built by members of this sangha followed the architecture of Tu Dam Pagoda, which was designed after the letter T and worshiped Gautama Buddha only in the Main Palace. Bao Quoc Pagoda is located on Ham Long Hill, which was first built by Master Giac Phong, a monk from China, in the late 17th century. At first, it was named Ham Long; then, in 1747 Lord Nguyen Phuc Khoat changed the name to Bao Quoc. In 1808, Emperor Gia Long of Nguyen Dynasty reconstructed this pagoda and changed the name to Thien Tho to show his piety to his mother (Thien Tho literally means living up to a thousand years old). 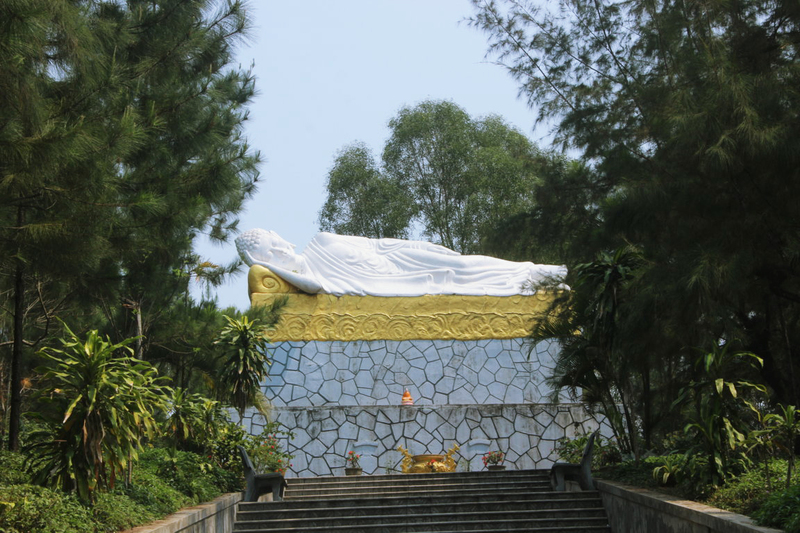 However, the tomb mausoleum of Gia Long was also named Thien Tho; hence, Minh Mang, Gia Long’s successor, changed the pagoda’s name back to Bao Quoc. Bao Quoc Pagoda was constructed following the Chinese character “mouth” – 口 in an area of two hectares. You have to climb dozens of stairs to reach the gate. Many trees are planted in the yard, filling the space with natural serenity. Lots of Buddha and Bodhisattva statues and other valuable sculptural works are still kept at this old-Asian-style pagoda. Tu Hieu Pagoda is shrouded by a forest on a hill of Ward Thuy Xuan. The surrounding landscape is very beautiful with a gurgling stream in the front. This pagoda was first built in 1843 by Master Nhat Dinh, with the name Thao Am An Duong, to practice Buddhism and take care of his mother. Later, Emperor Tu Duc of Nguyen. In front of the gate, there is a three-floor tower built in 1896 used to store Sutras at the command of the emperor. After passing the gate, you will see a crescent lake with lotus flowers and beautiful fish in front of the main palace. Around Tu Hieu Pagoda, there are many mausoleums of the Nguyen emperors’ wives. Due to the wonderful scenery and short distance from the city center, numerous locals and tourists visit this pagoda. Built in 1988, Huyen Khong Son Thuong Pagoda is located in an area of 10,000 square meters located in Long Ho zone. This pagoda has a large garden-forest with different kinds of plants, because of its beauty, it attracts many people. The pagoda grounds possess poetic scenery with green trees and glassy lakes. There are five lakes on the pagoda grounds each with elegant bridges. It’s also famous for calligraphy. You will find many calligraphic works written on stones or columns. There’s even a house for calligraphy in the pagoda. Address: Mount Chằm, Village Chầm (just a very small difference between the names), Ward Huong Ho, District Huong Tra, 17 kilometers away from Hue City. Thien Lam Pagoda was established by master Ho Nhan in 1960. Initially, it was humbly located in a small ravine. Because of master Ho Nhan’s morality, the Buddhists donated money to build up the pagoda in 1966. This pagoda is famous for the gigantic statues of Standing Buddha and Lying Buddha. Thien Lam Pagoda was designed following the architecture of Theravada Buddhism and has a tower marking the main building. The tower has two parts: the lower part is the main palace that worships Buddha and Bodhisattva, and the upper part is used to worship deceased masters of the pagoda. Truc Lam Bach Ma Meditation Institute the teachings of the Truc Lam Yen Tu Zen school, which was invented by the Buddha-King Nhan Ton of the Tran Dynasty in the late 13th century. It’s the first Zen Institute of central Vietnam, named after the Zen school and the mountain in which it’s located –Bach Ma Mountain. 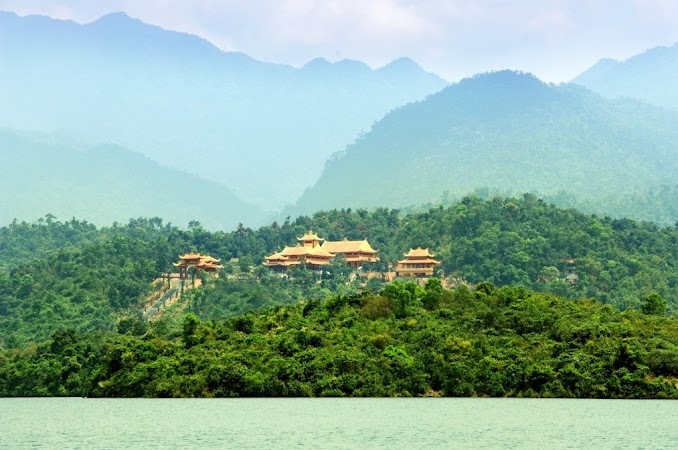 To reach this Zen Institute, you must take a boat to travel across the beautiful Truoi Lake. The scenery on the river and the institution is covered with fog that emulates heaven. You have to climb 172 stairs to reach the main gate. With the location in Bach Ma Mountain, the institute has many kinds of plants that thrive in the cool climate. 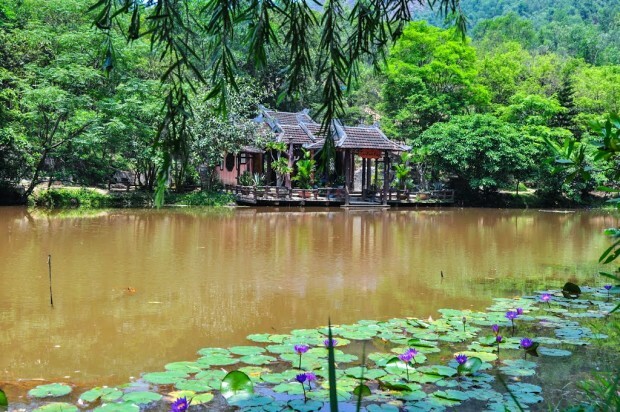 From the institute, you can see Truoi Lake and feel the splendor of the surroundings with a peaceful atmosphere. 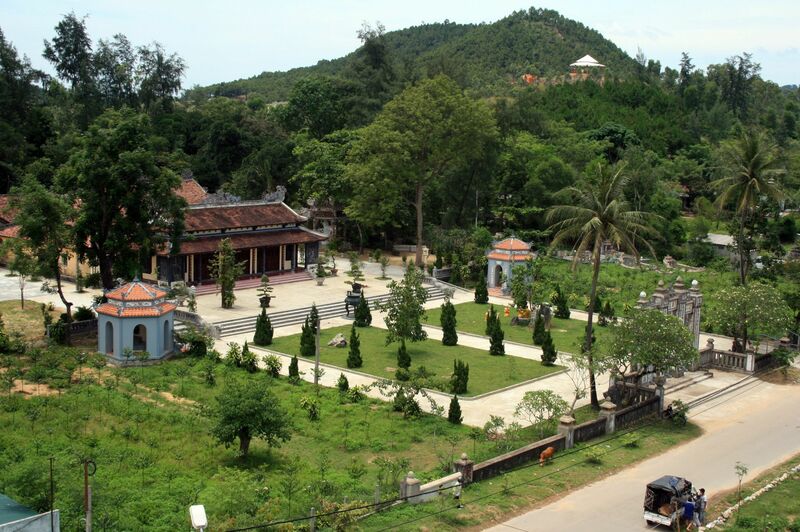 Around 1682 – 1684, master Nguyen Thieu chose the foot of Hon Thien Hill to build Vinh An Pagoda. In 1689, Lord Nguyen Phuc Thai changed the name to Quoc An (literally means national favor). Unfortunately, in 1786, there was a civil war and Quoc An Pagoda was destroyed badly. In 1806, princess Long Thanh donated a large amount of money to reconstruct the pagoda. Except for Huyen Khong Son Thuong and Truc Lam Bach Ma, all the pagodas are located in the center of Hue city and are close to one another, only about five to ten minutes apart by car. The most ideal schedule is Thien Mu – Bao Quoc – Tu Dam – Quoc An – Tu Hieu – Thien Lam. I have created a Google Maps itinerary for you. The remaining two temples are very far from the center. Huyen Khong Son Thuong is in the north of Hue city (17 kilometers aways) while Truc Bach Ma is in the south (52 kilometers away). Therefore, I suggest taking more day to visit these two temples. You can also integrate Bach Ma National Park into your day if you want to explore Vietnam’s natural landscapes. These special pagodas create a peaceful atmosphere and contribute to the special features of Hue City. These old pagodas stand as a witness to our history and contain lots of cultural and historical value of Hue as well as Vietnam. When you visit them, you can leave your bustling and hustling life behind and learn to live peacefully and simply.